Aided by personal documents and institutional archives that were closed for decades, this book recounts the development of physics—or, more aptly, science under stress—in Soviet Russia up to World War II. 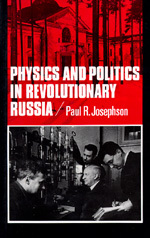 Focusing on Leningrad, center of Soviet physics until the late 1930s, Josephson discusses the impact of scientific, cultural, and political revolution on physicists' research and professional aspirations. Political and social revolution in Russia threatened to confound the scientific revolution. Physicists eager to investigate new concepts of space, energy, light, and motion were forced to accommodate dialectical materialism and subordinate their interests to those of the state. They ultimately faced Stalinist purges and the shift of physics leadership to Moscow. This account of scientists cut off from their Western colleagues reveals a little-known part of the history of modern physics. Paul Josephson is Professor of Political Science at Sarah Lawrence College.